Your old iPad can help teach kids a thing or two. 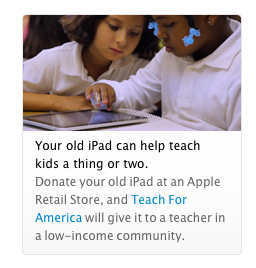 Donate your old iPad at an Apple Retail Store, and Teach For America will give it to a teacher in a low-income community. As noted by Macnn, there's no mention of tax deduction for the donation, but Teach For America is a corporation listed among those that provide tax deductions for direct donations. So if you're interested in donating your old iPad for a good cause, give your nearest Apple Store a call to get more details. I wish there was such a program in Italy.